Neemark is the extract of natural neem and contains triterpenoids & azadirachtin which are very effective against insects & yet are safe to human beings and animals. Low volume spray: Spray 1 to 1.5 litres of Neemarkper acre. per litre of spray solution. Heliothis, larvae, bollworms - Spray Neemark starting from 45 days of planting at bi-weekly interval. at an early stage. Best results are obtained if Neemark is sprayed during oviposition time. Cabbage: Diamond back moth damages cabbage crop to a great extent and can be controlled effectively by using Neemark. Jujuba (ber): During winter months, fruit fly is active ;spray Neemark twice during his season. Apples: For prevention of fruit borers, fruit flies, apple wolly aphids and apple mealy bugs. Melons & curcurbits: For prevention of fruit-fly, caterpillarsand beetles spray at fortnightly intervals. coffee: Green and red bugs, shot hole borers, thrips and miners attack the plants and berries. Spray Neemark from may onwards till the harvest. 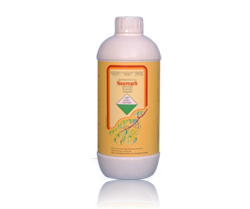 Tea: Tea mosquito multiplication can be stopped by Neemark spray on tea..
Onion: For control of thrips and maggots, spray Neemark every 15 days. 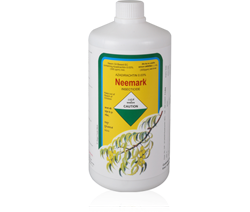 Application: during winter give Neemark spray to ovicidal action against the spring damage.